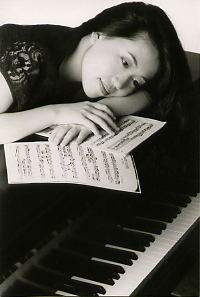 Pianist, I-Chen Chen has appeared as soloist and in chamber music throughout the U.S. and Taiwan, her native country. She made her first debut recital at the age of eight and appeared in her first concerto appearance with National Taiwan Youth Orchestra at age twelve. She has performed in Taipei, Sarasota, Chicago, and the Lincoln Center in New York, as soloist with Summit Symphony Orchestra, Albert Einstein Symphony Orchestra, Taipei Symphony Orchestra, and National Taiwan Symphony Orchestra. Her performances have been aired in the Manhattan Classical Opera and Concert Series by Manhattan Neighborhood Network on TV. She has also cooperated with such artists as James Sadewhite, Stephen Moshman, Jonathan Strasser, Tatiana Nikolayeva, Esther Lamneck, composers Barbara Jazwinski, Chien-Nien Chen, and Tiffany Wu. Dr. Chen garnered first prizes in the Taiwan National Piano Competition, the Concerto Competition at Summit Music Festival, the Steinhardt Concerto Competition in New York University, and was also a prizewinner in the Washington International Piano Competition and Five Towns Piano Competition. She was a recipient of M. Munz Scholarship at the Juilliard School, and the award of Outstanding Leadership in Graduate Piano Performance of New York University. Receiving her Bachelor and Master degrees from the Juilliard School, and the PhD degree from New York University, Dr. Chen studied the piano with Martin Canin, Miyoko and Albert Lotto. Her research interests include 19th century piano literature, especially Fryderyk Chopin's piano works. Formally teaching at NYU, She is recently a piano faculty member in Concordia College and Turtle Bay Music School.